My brother and I waited until we knew we were alone, and darted into the little pantry. The old fridge hummed and hissed and gurgled as the ice-water compartment jiggled its innards. That’s what we — me at age eight, and my brother, almost six — thought it sounded like then. Gently, I eased the fridge door open, waiting for the seal to release like an octopus relaxing the suction pads on a tentacle fastened to its prey. A satisfying ploop sound followed. I looked past the Flora margarine containers filled with mango pickles, the tub of ghee, the jug of milk, an enamel pot of sweet rice, and grabbed the paper plate sealed in shiny aluminium foil. We strained our ears. Convinced there were no adult footsteps in the vicinity, I peeled back the foil. Something pungent, earthy like wet peat, hit my nostrils, immobilising my senses for a moment. The sensation carried, a wide-eyed passenger on a bullet train, a message transferred between 12 million olfactory receptors in the nasal cavity and an eight year old’s olfactory bulb. Friend, or foe? “What’s that?” my brother asked about the smell, scrunching his face into a ball, while touching the red wax of a Gouda wedge on the plate. The Gouda we were familiar with. Our toasted sandwiches oozed with the yellow, almost-plastic cheese and thick slices of tomato on nights when Mother couldn’t face making another curry for dinner, which wasn’t too often. Next to the Gouda, between the paler Cheddar and a gooey cheese with a chalky exterior still unidentifiable to us, lay a nugget with blue veins and a come-hither appeal. Had we the willpower to resist? We looked at each other, flicked our necks across the passage (still safe), and made a silent pact that whatever happened next, we’d remain mum. This was after all, a takeaway from a post-graduate get-together that Father brought back, one where I imagined there would be ladies with yellow hair and short floral dresses, referencing hefty textbooks and eating foods we’d only seen pictures of in Mother’s cookbooks. Like the flaked hake mixed with mayonnaise and Cayenne pepper, shaped to resemble an actual fish with a piece of red cherry for an eye and wafer-thin cucumber slices for scales. Maybe there were scones (our favourite) with lumpy strawberry jam. We knew from television advertisements that other people ate cheese with crackers or in little blocks attached to toothpicks, served on trays you passed around a room with floral settees. But we never saw this variety of cheeses at the local Save-o-Matic store. We knew that we didn’t have permission to raid the fridge at will. There were consequences, but we allowed this knowledge to hover in the background as we eyed the strange contents of the plate. It was the late ‘80s and I’d just learned about chlorofluorocarbons and the devastation of their environmental impact; the idea of hanging around an open fridge, which I was told emitted plenty of CFCs, poking around for minutes, made me feel ill with guilt. I removed the paper plate from the pantry and slid it onto the linoleum-covered kitchen table. Once the blue cheese touched my tongue, so sharp, with the depth of umami greater than my grandmother’s spicy rassam, the fiery, savoury South Indian tamarind and pepper soup, I had to draw deeply for air. It was aggressive in its scent, yet it coddled the mouth with the silky indulgence of cream. The saltiness was surprising too, a spike so unfamiliar in our school sandwich cheese. And there were threads of alluring blue. Smurf-blue bubble gum milkshake was all the rage back then. My brother squished a bit of it between his fingers, a look of horror spreading across his face. “Yuck,” he whispered, as we stifled giggles that spurted from our noses and threatened to spasm down our abdomens. 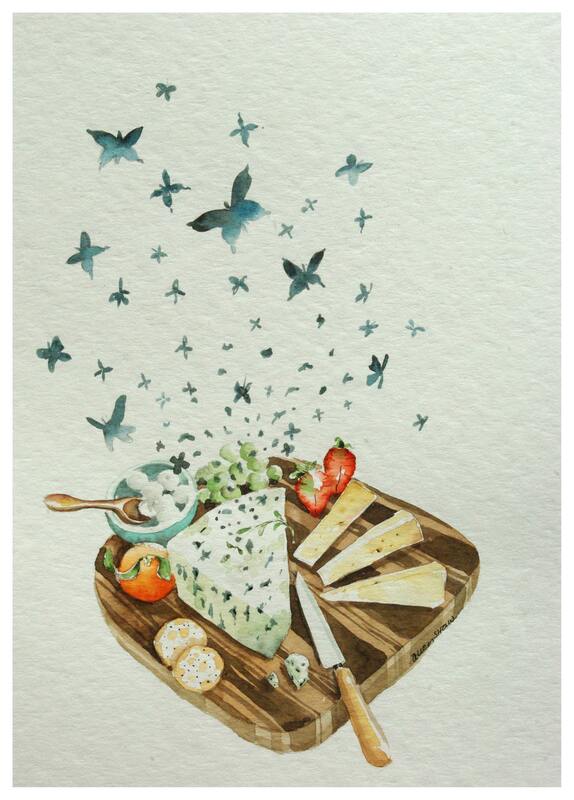 He wiped the cheese over the paper plate, as if finger painting a streak of lightning, creating a greyish stain. Then he poured a glass of water from the tap. “Shush,” I instructed, a reminder not to betray our agreement. I smoothed the torn aluminium foil back around the plate, tiptoed into the pantry and gently tugged on the fridge waiting for the seal to signal me in. It would be years, almost four, when we would buy a piece a blue cheese for the family, a milder, almost spreadable variety compared to the one we tasted on our clandestine operation that day. By then, my brother had mysteriously acquired a taste for it. I was almost 12 when Father declared me a “senior” and this meant accompanying him to purchase groceries from the large supermarket across town, handwritten lists tucked in my denim jean pockets, and a pen to calculate when we hit our budget. It was only on these outings that we would see white families up close for minutes at a time. Walking the aisles, we acted nonchalantly as if these interactions occurred with regularity. It was only Mother, when she joined us, who would stare at them, curiosity painted on her beautiful face. By virtue of my new senior status, I had accumulated a growing carte blanche with the ingredients and produce we bought. I reached for the blue cheese. Father had always included one or two unusual foods in our trolley — a tin of crabmeat, a package of wackily flavoured sausages, a foreign-brand chocolate for us to share. Having never seen anything of the world beyond our province, with just two trips across the country under his belt — one before he and Mother married and the other when I was around 10 or 11 — this must have been his way of consuming an otherness beyond the confines of our existence as South African Indians. As a 5th generation descendant of immigrants, I was given the label “Indian” and it cloaked me, a quilt made of scraps of hand-me-down heritage. It scratched and unravelled in parts but was my sense of comfort and my only badge of identity at the time. In our world, a commune of brown-skinned people, we reflected our habits and traditions as if holding up a mirror to each other. We existed on a periphery of everything else, beyond the blackness and whiteness of a racially segregated land with apartheid’s unfathomable laws that demanded you pick a side. A world with curry and biryani, lassi and sojji, tight-knit and disciplined. Anglicised only as far as teatime was concerned, in much the same way as Indians of the diaspora in the colonies around the world have retained this British peculiarity. In our homes, there was always tea, and sometimes it was a spiced chai like they drink in the Motherland. The monthly journey to the Checker’s supermarket brought with it an invitation into a world so beyond our own, I’d take in the labels and the faces when I thought no one was looking in my direction, later to play it out when I sat on my bed. Perhaps, my inclusion of the blue cheese in our family’s trolley was a desperate and dramatic statement, an allusion toward individuality, of having crossed the electric fence barefoot and not being stung. And of liking it, the rank richness sticking to the tongue and broadening the universe in that moment in our old kitchen, my brother and I, like characters in an Enid Blyton story, where the kids disappeared into a magical, treat-laden world of The Faraway Tree. Of course, the blue cheese was always there to select off a supermarket shelf, but it’s existence, then, was as unfamiliar to us as the homes of rich white families living in the shaded mansions with swimming pools in suburbs we skirted to get to Wylie Park. Years later, my cheese-loving Dutch husband will express his deep dislike of blue cheeses that veered past a certain pungency. Just the sort I actually like, and each time I cut a small wedge to be paired with a ripe fig or melon preserve, I think of my brother’s reaction in our family kitchen all those years ago. I think of the absolute thrill I felt, as that curious scent travelled with a message from the olfactory bulb to the hippocampus. And then to the amygdala, that sweet universal centre accumulating the files of our emotional development, reassuring me that there was a world beyond our pantry and I’d be welcome.